Build, create, invent, and discover 28 awesome experiments and activities with Maker Lab.Created in association with the Smithsonian Institution and supporting STEAM education initiatives, Maker Lab has 28 kid-safe projects and crafts that will get young inventors’ wheels turning and make science pure fun.Explaining science through photographs and facts that carefully detail the “why” and “how” of each experiment using real-world examples to provide context, each activity is appropriate for kids ages 8-12 years old and ranked easy, medium, or hard, with an estimated time frame for completion. Requiring only household materials, young makers can build an exploding volcano, make bath fizzies, construct a solar system, make an eggshell geode, and more. 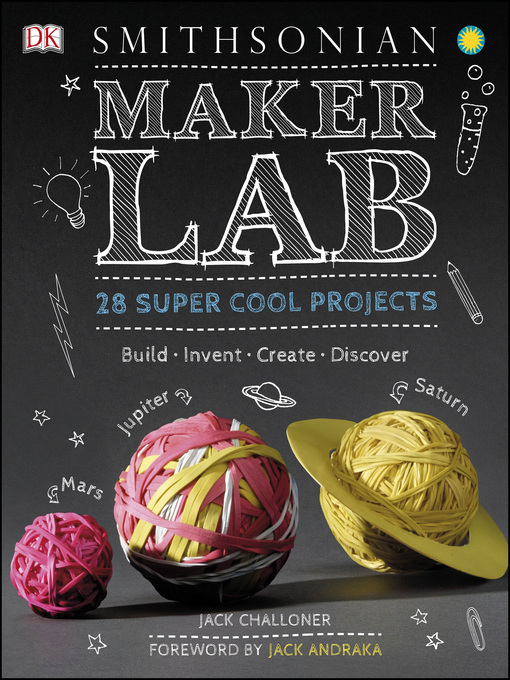 With a foreword by Jack Andraka, a teen award-winning inventor, Maker Lab will help kids find their inner inventor to impress friends, family, and teachers and create winning projects for science fairs and school projects. http://e-inc.overdrive.com or http://chathamconc.oneclickdigital.com. Let us know what you think of these selections, and tell us about eBooks you’ve enjoyed – we may feature them here! This entry was posted in eBook Friday and tagged science, young adult nonfiction. Bookmark the permalink.